Of course, having a handy Household Checklist doesn’t do much unless you have a plan on how to use it regularly. The plan is to make it a part of your Weekly Cleaning Routine. I leave a spot open for it every Friday in my routine. Of course, you can surprise yourself every week with what your task will be, but I find that most people are successful if there is a little pre-planning involved. There are different options for planning what you’ll do on your HH List Chore Day. Don’t worry, both are easy! The first and best option is to look at your HH List when you plan your week (I suggest planning the week ahead every Sunday night) and write the task in your planner. 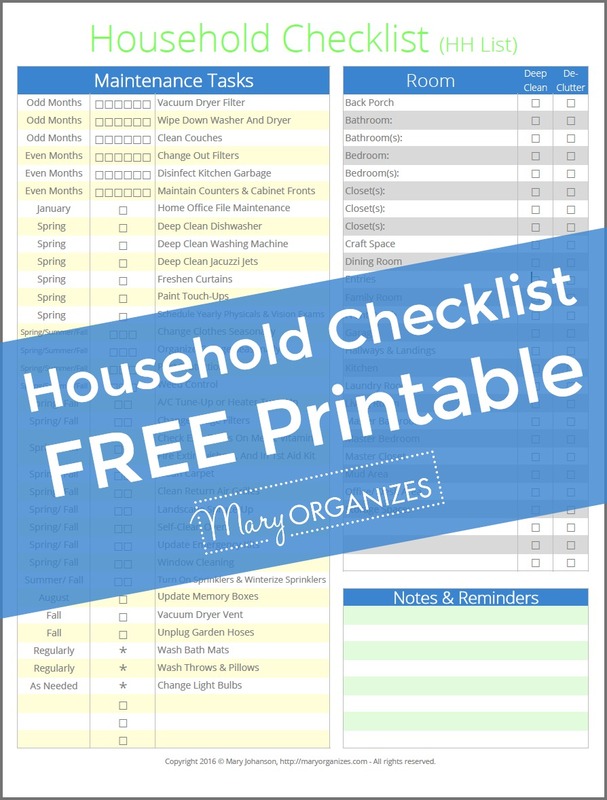 If you have a Mary ORGANIZES Home Management Planner, the HH List is already in the Home Management Section of your planner for easy reference. Every week during your Home Management Session (HM Session), take a look at this sheet and add a task (or two if it makes sense) into your weekly plans. It is a sensible and manageable way of spreading big cleaning tasks throughout the year. The other option is to look at the week ahead as you complete a chore and check it off the list each week. In all of these cases, you are using already-existing events to remind you to look ahead and plan. It is always easier to build on already successful things. Also, I created an Editable PDF File so that you can keep track of everything electronically. It’s in my shop! I hope this HH List becomes your secret weapon for keeping up with it all too! Some great ideas here – things I never thought to check, much less clean. Thanks so much. I am so glad it might be helpful! Very organized! Thank you. Some Of the items such as winterizing sprinklers I don’t have to do. I live in central Florida and a townhome. We also just moved in with five households worth of belongings due to three deaths in the family and my grown daughter moving back in. Plus I’m in year one of a two year recovery from a major surgery and illness but I’m super excited to start living and Organizing again. Thank you for the well thought out PDF. Thank you! So glad it could help! Thank you for this Blog. I moved into this house years ago and have yet to fully unpack. Possibly because we have two household’s worth of “stuff”. My mom lived with us and she passed away over a year ago… maybe you can discuss how to properly sort items that belonged to a loved one that passed away? Thank you again for blessing us with your gifts. I deal with some of those issues in the Reading List recommendations. Did you have a chance to read those yet? What you are going through is very difficult, and unfortunately very common. Thank for this list it is great!! Do you have one for grocery shopping as well? Your planner is gorgeous. I wish it was an app because I prefer digital. Thanks for all the great advice and ideas, especially home maintainance planner. I’m going to add those items to my calendar. My life would be much more cluttered without.